Vodafone has agreed to acquire Liberty Global’s operations in Germany, the Czech Republic, Hungary and Romania for an enterprise value of €18.4 billion. It accelerates Vodafone’s converged communications strategy through in-market consolidation in Vodafone’s largest market, Germany, and in Vodafone’s Central and Eastern European (CEE) markets, the Czech Republic, Hungary and Romania. 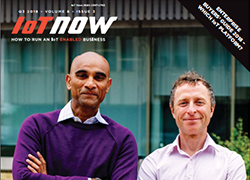 Paolo Pescatore, VP Multiplay and Media, CCS Insight tells IoT Now, “This is not a game changing move. Both companies are struggling to grow in a rapidly converging world. If anything, it reinforces the importance of owning both fixed and mobile networks on the road towards 5G. The joint venture in the Netherlands’ has laid out the blueprint for both companies to come closer together. “For Vodafone, the acquisition of selected Liberty Global assets is a strategically sound approach to strengthen its position. Convergence is one of Vodafone’s strategic pillars, with nearly 30% of European service revenue now coming from its fixed line business. It is consistent with previous acquisitions such as Kabel Deutschland in Germany and Ono in Spain,” says Pescatore. He continues, “For Liberty Global this is a further sign of disposing of non-core assets, specifically in markets where it lacks the resources to compete or needs to invest heavily to match rivals. Austria is a prime example of this. We expect Liberty to use these funds to strengthen its position in other markets such as the UK. “Vodafone now becomes a powerful rival to Deutsche Telekom in bundled services. However, we strongly believe that regulators will block or restrict the deal. Vodafone and Liberty Global have a relatively solid presence in the fixed line and TV markets, so any move would cut the number of companies in both segments,” Pescatore concludes. Gary Barton, principal analyst for Enterprise Services at GlobalData, a data and analytics company, reflects that, ‘‘The proposed deal will significantly strengthen Vodafone’s operations in key strategic markets. Germany is its largest national market and the company has long since highlighted that Eastern Europe represents an important area for growth. ‘‘As Vodafone is an established provider of consumer and enterprise telecoms services across Europe with an existing presence in all four countries covered by the proposed deal, the impact on the European telecoms market will be high. The fibre assets acquired are ‘future proof’ and are well suited to support cloud-based consumer services such as video streaming,” adds Barton. Vodafone becomes a next generation network (NGN) owner in Europe, with 54 million cable/fibre homes ‘on-net’ and a total NGN reach of 110 million homes and businesses, including wholesale arrangements. Creating a converged national challenger to the dominant incumbent in Germany with the scale to accelerate achievement of the German government’s digital ambitions, bringing Gigabit connections to around 25 million German homes (62% of total German households) by 2022. The combination of Vodafone and Unitymedia’s non-overlapping regional operations will establish a strong second national provider of digital infrastructure in the German market, building on Vodafone’s long track record in bringing sustainable and effective choice and competition to the German consumer and enterprise markets.